Biological anthropologist Helen Fisher, who is also the chief scientific officer for Match.com, says the brain is primed to fall in love in the spring. 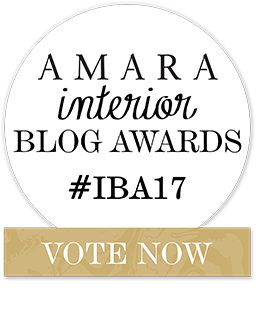 Inspired by a sudden upswing in romance I decided to search for interiors as well as exteriors inspired by love and here’s what I found! 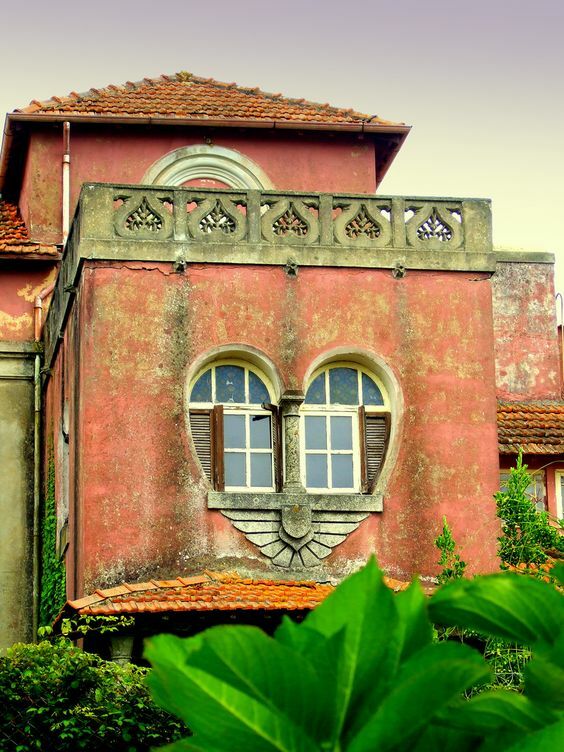 The Uma Casa Cheia de Amor in Miramar instantly caught my attention for its beautiful heart shaped window! Not only it is painted in colour pink, which stands for unconditional love, understanding and compassion but the exterior arrangement of the house speaks of nothing but love. The house is located not far away from the most romantic beach in Portugal beautiful for the Chapel of Senhor da Pedra I visited last year. Uma Casa Cheia de Amor Photograph Courtesy of Tina Silva. 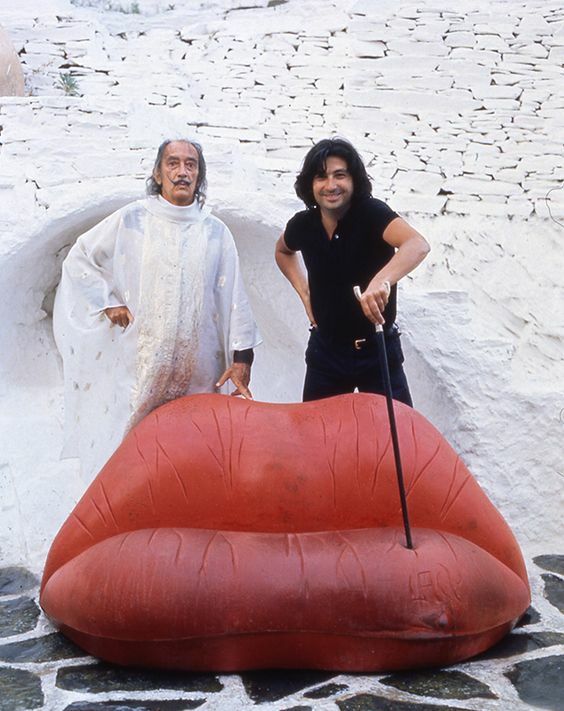 The more I searched for love in interior and product design it was becoming clear that it all started with the man responsible for a surreal lip sofa, Salvador Dali. 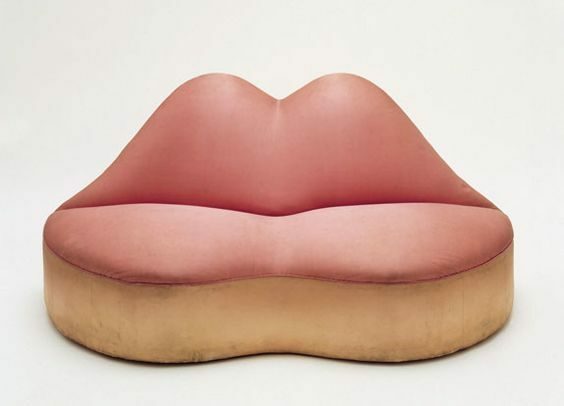 Mae West Lips Sofa, 1937 – A surrealist piece of furniture designed by Edward James and Salvador Dali. When patrons and artists collaborate often the result is nothing less than a great work of art! The “Mae West” lip sofa is one example from the 20th century’s most sensuous and iconic pieces of furniture. It was made in the mid-1930s when Dalí was broke and Edward James, the millionaire poet and eccentric patron of the arts, offered Dali a monthly salary for a year in exchange for everything he created in that time. 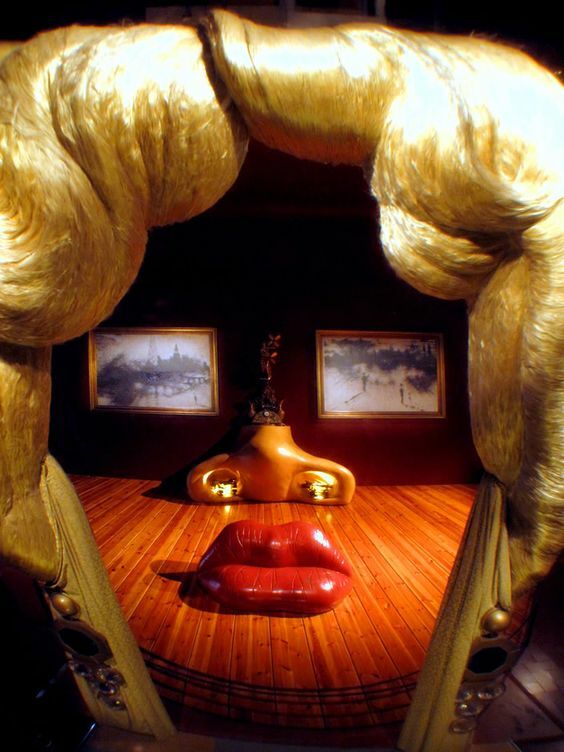 The lip sofa relates to Dali’s paintings and drawings that were inspired by the Hollywood actress, Mae West. Only five sofas are known to have been made by Dali’s patron and he kept them all. Three are still owned by the Edward James Foundation, and two were sold before James’s death in 1984. The Brighton Art Gallery and Museum bought one and the other was sold by Christie’s to a private collector. I may have traced the private collector but before I reveal her name I’d like to mention Dali’s collaboration with an architect and designer Òscar Tusquets Blanca, who first met Dalí in 1974, whilst Blanca was designing a wing for his Theatre-Museum in Figueres. “This project was the result of friendly collaboration with Salvador Dalí. Blanca says “I suggested creating a room in his museum that when seen from a particular viewpoint, would reproduce a three–dimensional image of his famous Face of Mae West, painted by the artist in 1936, at the height of the surrealist moment. 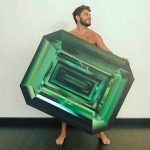 The painting, in turn, represents a room, becoming an interplay in which a space is created to reproduce a plane that, in turn, represents a room. The only entrance to this room in the museum is at the side, so space is incomprehensible until we stand at the axis and climb the steps that take us to the viewpoint that coincides with the painting”. One out of five Dali’s lip sofas found it’s home in Diane von Furstenberg‘s Manhattan Penthouse in the Meatpacking District. 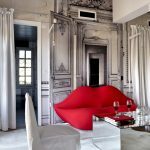 The vintage pink Salvador Dalí lip sofa in her space looks amazing with rosy pink walls. The result could not be more feminine and bold! Diane von Furstenberg in her New York Apartment Photograph Courtesy of Diane von Furstenberg. Inside one of Diane von Furstenberg’s Shops. And this is what her apartment looks like on the outside. More lips! Diane von Furstenberg’s live/work space in Manhattan’s Meatpacking District. 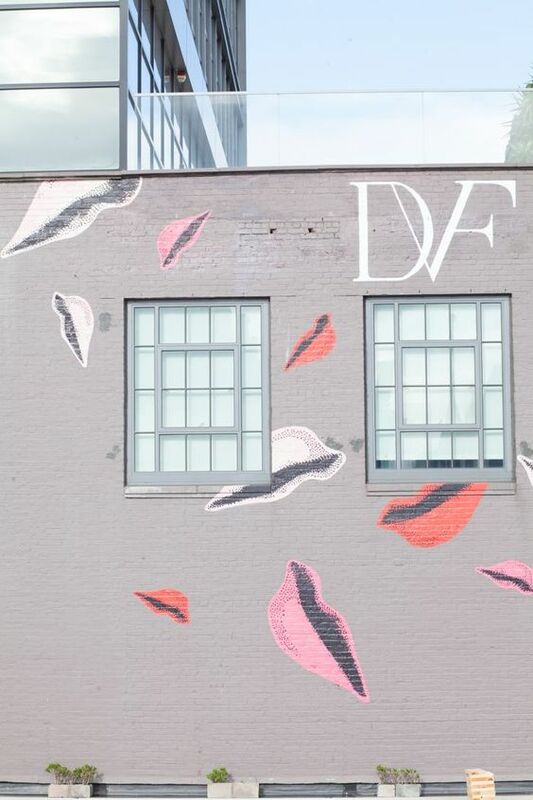 The building’s whimsical facade includes DVF’s trademark lips Photograph by David Cortes. Fashion brand Maison Martin Margiela also known as MMM does not just dress people, but places too. Here’s what I found whilst exploring the avant-garde ambience the fashion brand created in this soothing pastoral setting. The Elle Decoration South Africa featured the ‘Isle of Birds” cabin revamped by Maison Martin Margiela to mark the spa’s 10th anniversary which is a part of the luxurious Les Sources De Caudalie hotel and spa, located in the vineyards of Martillac, near Bourdeaux. The spa is well known for its unique vinotherapy treatment and counts Paradis, Depp, Cotillard and Galliano as regulars. The lip sofa could not look more dramatic in this setting! ‘Isle of Birds” cabin revamped by Maison Martin Margiela Photograph by Nicolas Matheus. Could Dali’s fascination with Mae West equal to Fornasetti’s obsession with Lina Cavalieri? I don’t think so! When Fornasetti found the photograph of Lina’s languidly sensual face in a nineteenth-century French magazine he could not let go of her enigmatic beauty. 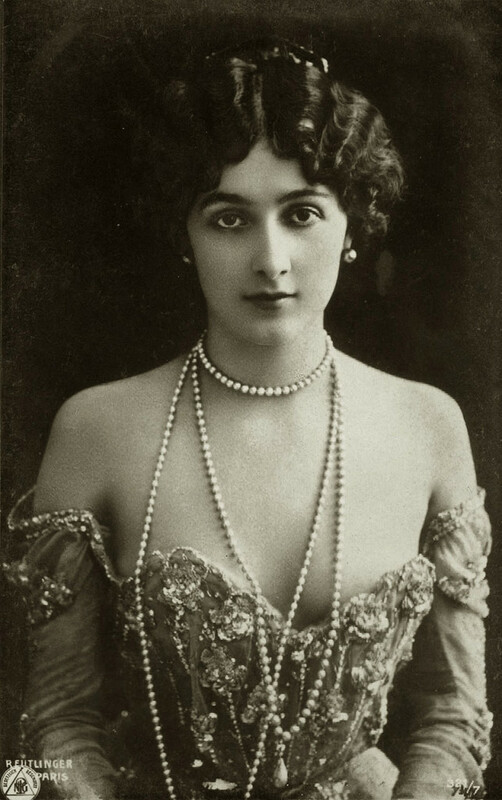 The Italian opera singer Lina Cavalieri (1875-1944), was an admired diva of the Belle Epoque, known for her artistic talent and for her fame of a seductress. To Fornasetti Cavalieri was his personal Mona Lisa. He worked over 350 variations of her face through his “Tema e Variazioni” saying that Cavalieri’s face was “an archetype – a quintessentially beautiful and classic image, like a Greek statue, enigmatic like the Gioconda and therefore able to take shape into the idea that was slowly building in his mind. Peeking at us from plates, candles, wallpapers and chairs, Lina’s face became more than a motif in his work, it became iconic of Fornasetti’s design worldwide. 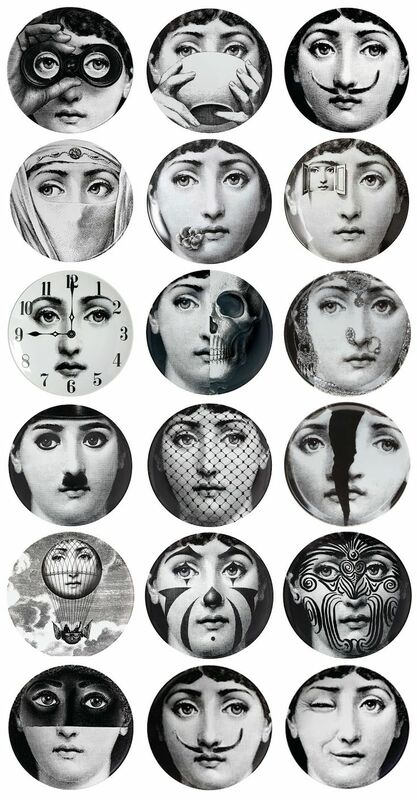 Fornasetti worked over 350 variations of Lina’s face through his “Tema e Variazioni”. When asked why so many variations of a face of a woman Fornasetti said: “I don’t know, I began to make them and I never stopped”. 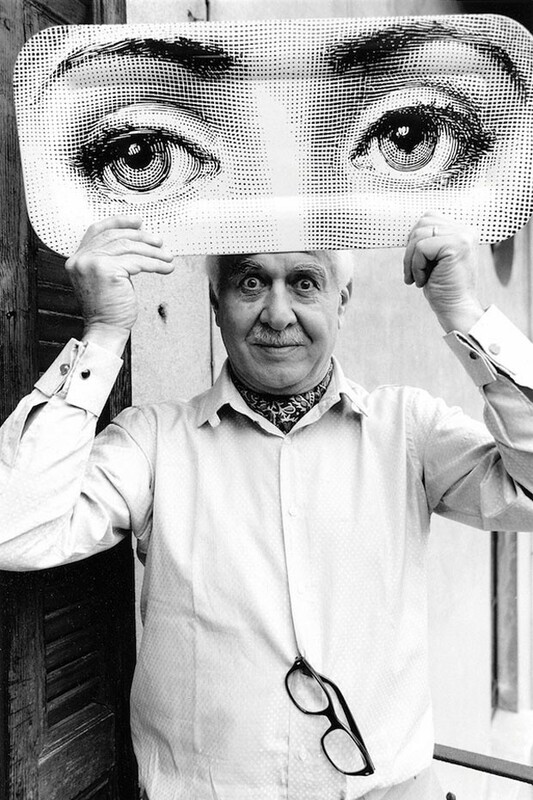 Piero Fornasetti holding a Tray with Lina’s eyes Image Courtesy of Fornasetti. 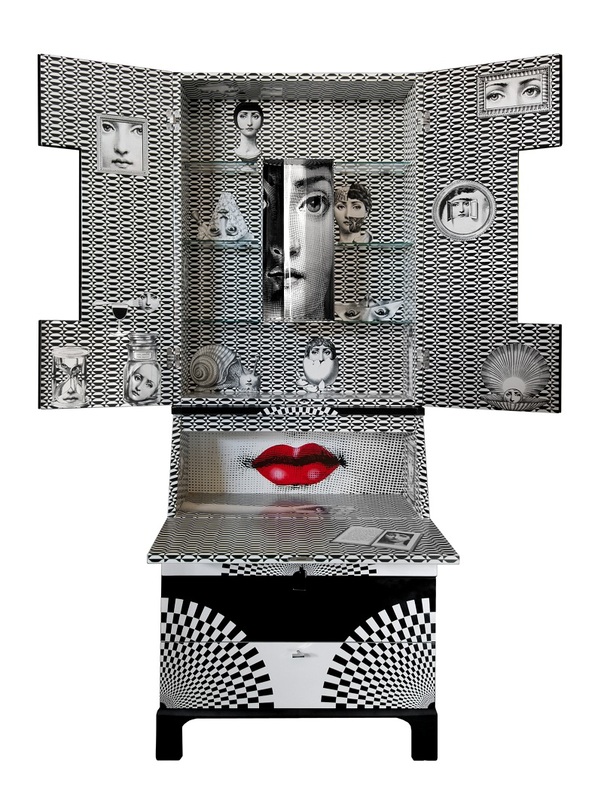 There is a booming collector’s market when it comes to Fornasetti originals, especially the elaborate trumeau drinking cabinets first produced in 1951 in collaboration with Giò Ponti: a one-of-a-kind example of the neo-Palladian “Architettura” trumeau fetched a record $230,000 at the 1998 Los Angeles auction of pieces from the Fornasetti historical archive. But it’s the face of Cavalieri – vulnerable yet wise, with kissable lips yet a melancholy otherworldliness in her big eyes – with which Fornasetti will be most closely associated. Today the Tema e Variazioni series is being reinvented and extended by Fornasetti’s son Barnaba whose Trumeau “Fun Fan” cabinet is among the items I admire as it is both beautiful and functional at the same time. 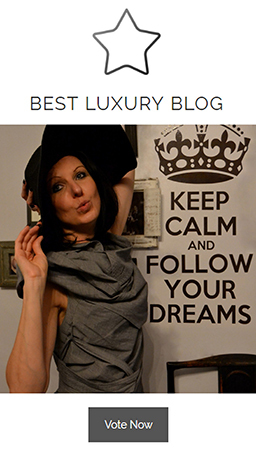 Writing about interiors inspired by love I could not bypass the model-muse Daphne Guinness and her Eclectic New York City Apartment. Daphne called on architect Daniel Romualdez to design her three-bedroom Fifth Avenue apartment. 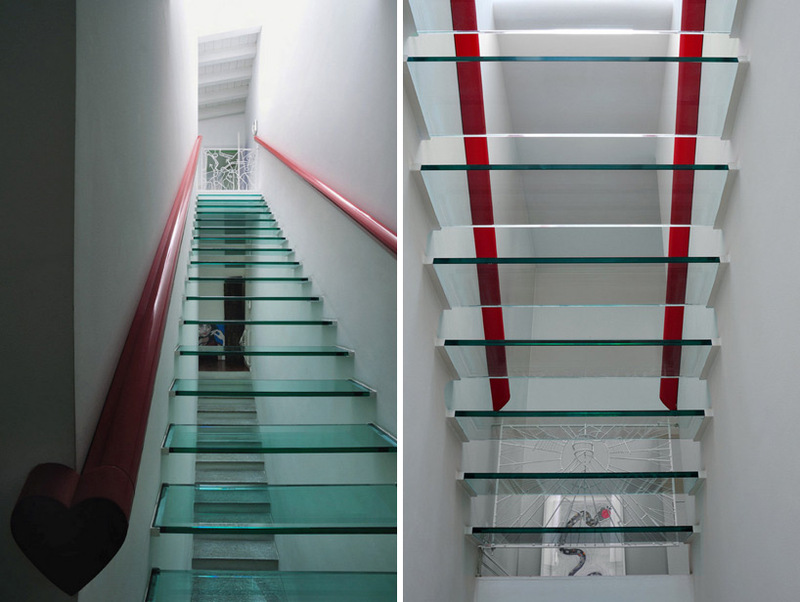 By entering her world, one proceeds through a hall of mirrors that seems to stretch into infinity as the walls as well as ceiling are completely mirrored and the effect is enhanced with the blood red carpet underfoot. 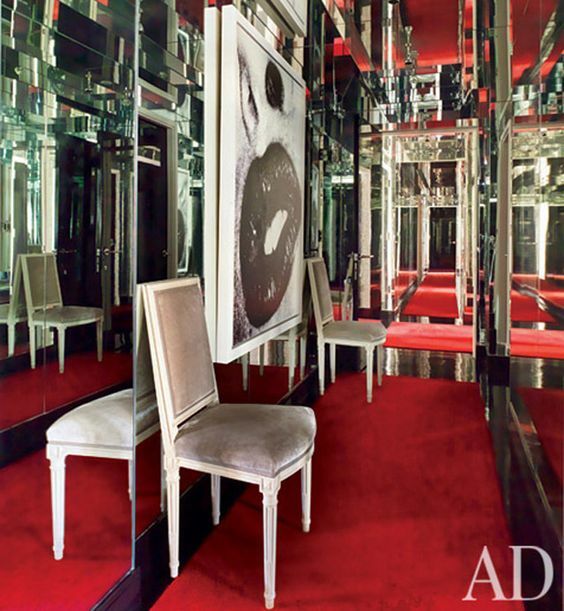 Mirrored Corridor Daphne Guiness New York City Apartment Photograph Courtesy of Architectural Digest. When asked whether she wanted a corridor or an experience every time she walked in the door, Guinness said she wanted the experience. “Some people get confused in there, but I love it,” continues Guinness. Living room Daphne Guiness New York City Apartment Photograph Courtesy of Architectural Digest. Silver-leaf paper on the ceiling, high-gloss ebonised-wood floors, deep red sofa and smoky mirror on one wall where the artwork is displayed expresses Guinness’s unusual sensuous persona. My search for interiors inspired by love and female beauty has brought me back to Italy once again! “A keyword about Italians is the obsession,” says Fabio Novembre, one of Italy’s most celebrated designers known for his whimsical furniture designs, as well as playful interiors. “We are all always obsessed with something. 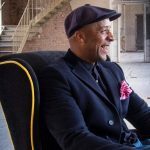 And obsession is a great way to evolve and go forward.” Novembre jokes that if he weren’t a designer today he would probably be in jail for his personal obsessions, the source of which is female beauty and eroticism. 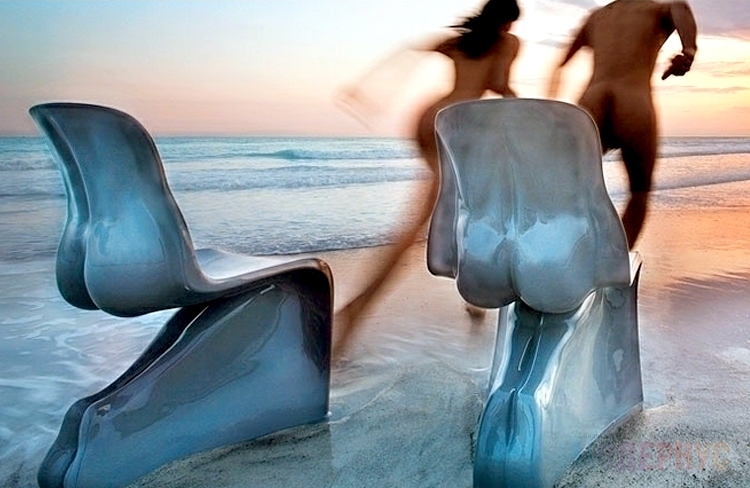 Novembre’s own signature pieces include one of my personal favourites, Him & Her chairs whose seats mimic the backside of the male and female form. Novembre cites the creation of Adam and Eve as his inspiration behind this design. The Lord God crafted man from the earth and blew into him the breath of life and man was alive. And then the Lord God took a rib that he had taken from the man and from it crafted a woman and lead the woman unto the man. An evolution of the hermaphroditic original declined into the harmony of the two sexes. They assume sculpted forms like naked models of seduction but they feel no shame. 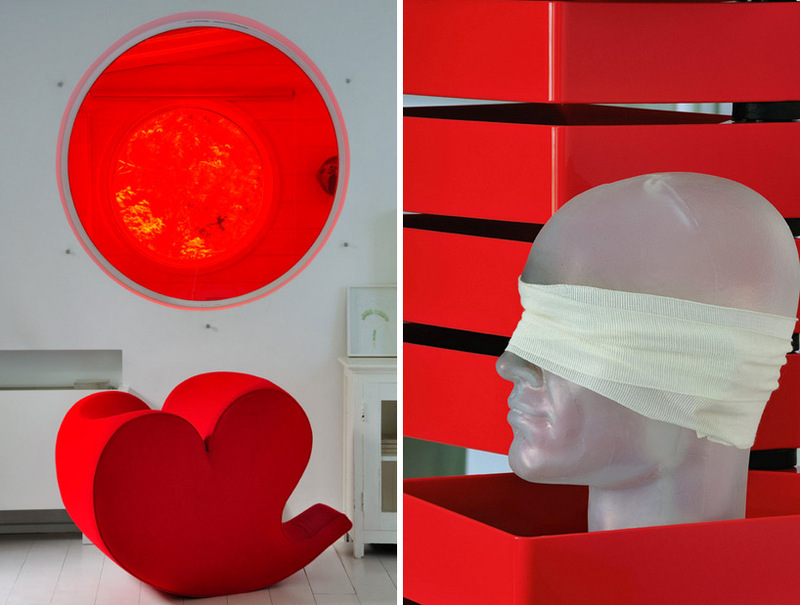 Fabio Novembre’s house studio where he lives with his wife Candela is an expression of their love for one another. The rooms are full of passion, fun and bold features. Fabio Novembre home studio in Milan. A large circular window offers views between Fabio and Candela’s room, and their daughters’ Image © Molteni & Motta, Courtesy of Home Portraits. Fabio Novembre house studion in Milan. 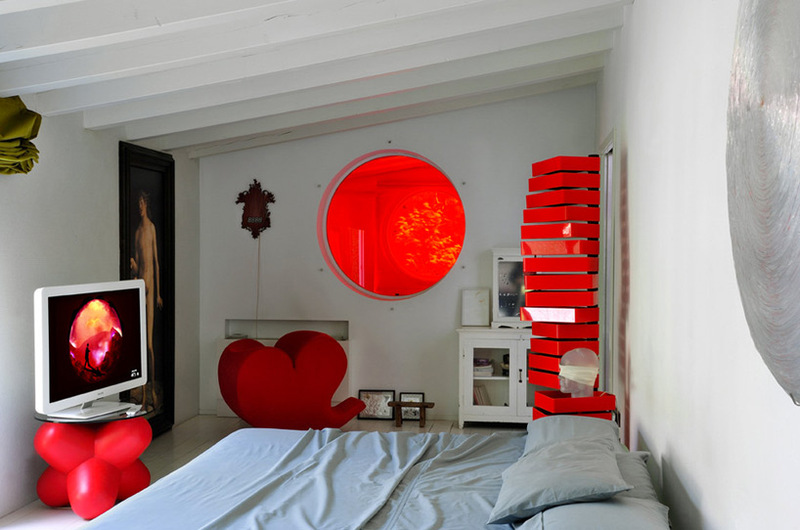 Lovely red details Images © Molteni & Motta, Courtesy of Home Portraits. 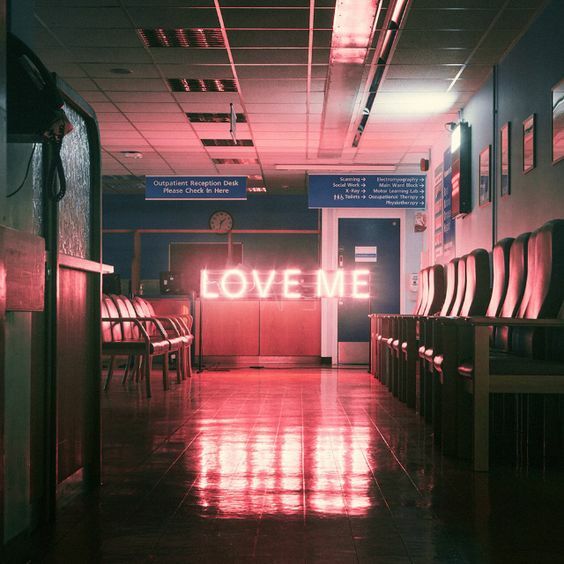 To create the striking visuals for their new album, 1975 called upon London-based designer Samuel Burgess-Johnson and American photographer and designer David Drake to craft atmospheric, typographic imagery for their songs. 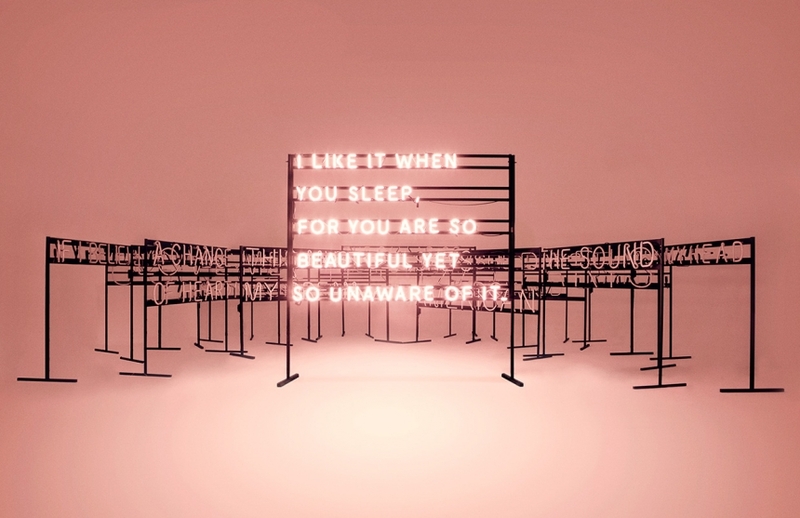 Pink neon signs spelling out the song titles were set against various backdrops and shot in different locations to evoke the sentiment of each tune. Love is definitely in the air or at the very least, lust. Before getting naked with someone new please be aware that love hurts, love scars, love wounds and marks. 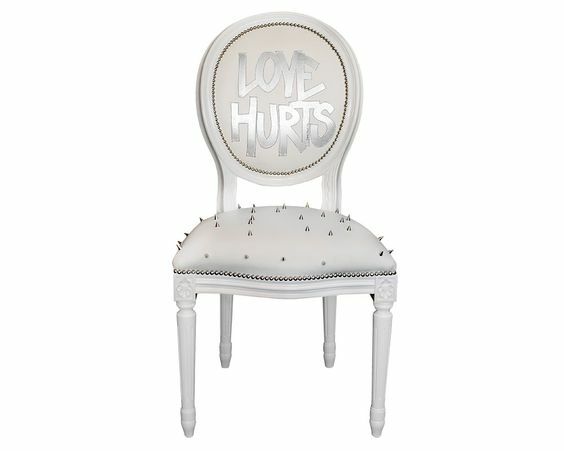 It’s not the song by NAZARETH I want to discuss here but the chair with spikes by rebellious design duo Jimmie Martin among other of their “light-hearted” and “love inspired” designs which often carry a hidden message. As we’re accustomed to thinking of love as an overwhelmingly positive experience and something that just happens to us and not something we have to work on to make happen as our primary focus is on self-expression of our new found love and not on our own. The object of our desire will not experience this in a positive way if we don’t also first love ourselves. 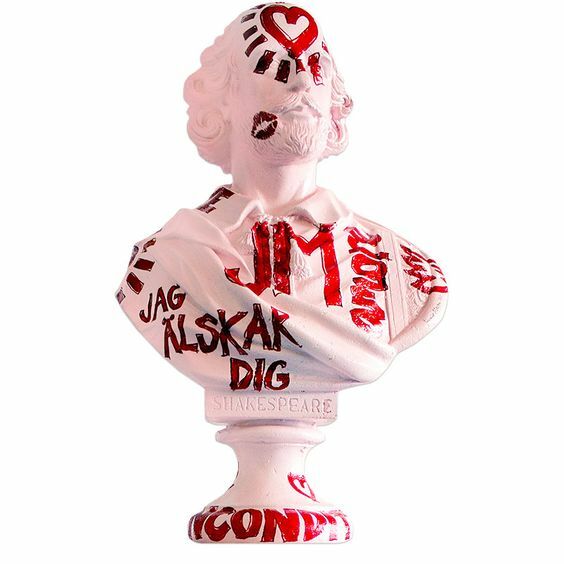 May this bust of ‘Shakespeare in Love’ be a reminder that if you’re looking for love, love yourself first. When we love someone, we are willing to accept that person as they truly are without an attempt to idealise. We will try to understand how the other person hopes to reach their potential which not only requires patience and time but also hard work because often, the other person is not even clear on what would fulfil him or her most. 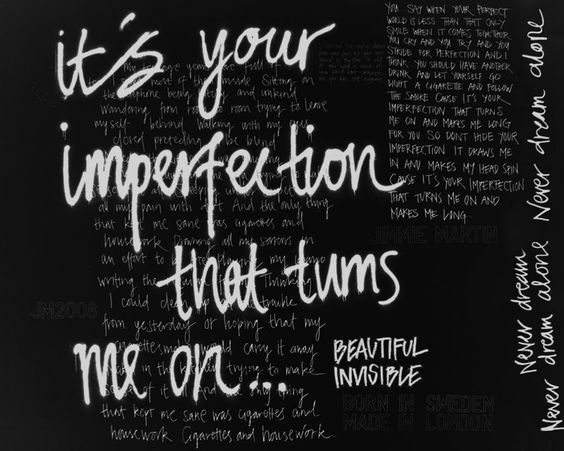 Now that we are almost at the end you may ask if is it worth all this pain to love? My answer is YES because to LOVE is to live fully, to have a PURPOSE that makes life worth living! 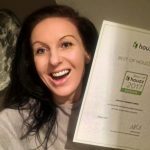 We were awarded Best of Houzz 2017 for Design!